"Dango Uri" was originally written for the puppet theater and staged for the first time in 1901 in Ôsaka under the title "Nemosayuru Haru no Usuzuki". It was inspired by a Kiyomoto-based dance, which was entitled "Tama Usagi Tsuki no Kagekatsu" and was staged for the first time in the 9th lunar month of 1820 at the Nakamuraza, and it also utilized a famous passage from the michiyuki of the old play "Igagoe Dôchû Sugoroku". "Dango Uri" was adapted for Kabuki in 1929. 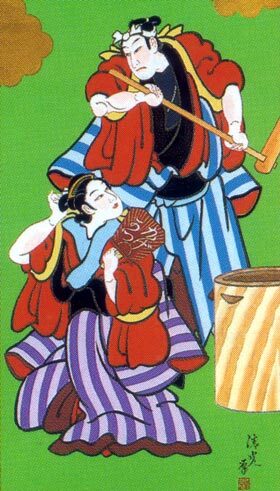 This dance humorously depicts a couple of rice dumpling sellers, Kinezô the man and Ofuku the woman, travelling from place to place with their mortar and pestle and enacting on stage some aspecs of their life in this dance, including the famous pounding of the rice in full harmony, as a symbol of a happily-wed couple.